I find having a notebook and organisation system for business planning and blogging makes me more intentional with my actions. Up until now I have been using a simple notebook, but without any structure I have found it quickly becomes an undecipherable mess of ideas, rough drafts, and task lists. There are plenty of downloadable, printable planners available and a whole “filofax as a lifestyle choice" subculture, but I often find these methods a little too fussy for my tastes and they tend to include a lot of content I simply do not need. If, like me, you prefer a more personalised planning system you can easily make your own planner with very little effort. I am making one of these for both my business and my blog, but I’m using the blogger version here to demonstrate how to make one yourself. My favourite notebooks to work with are the MUJI A5, 72 page narrow-ruled notebooks. 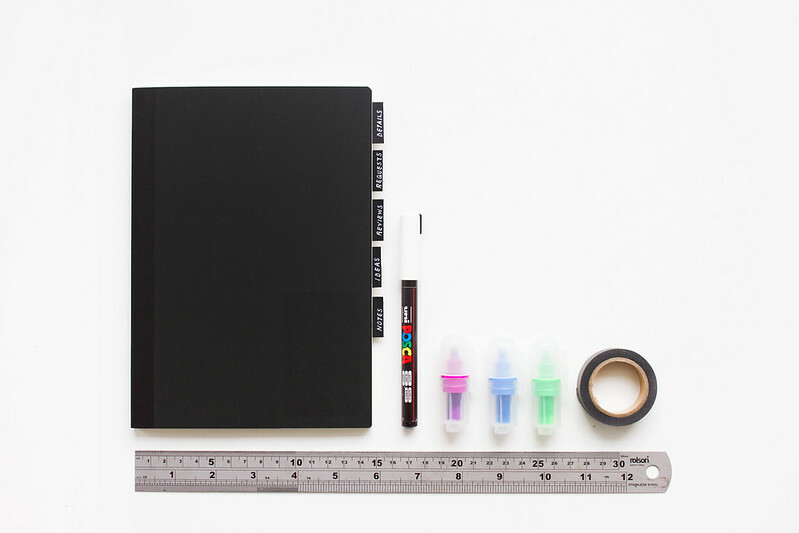 The compact size makes them portable, the plain design means they are easy to customise, and narrow ruled lines make everything look neater plus the paper quality is pretty good considering the price. To start, you want to decide what sections you want to include, allocate a number of pages to each section, and make tabs for the section dividers. I broke my planner down into the following sections and tabs. I made tabs that were an 1-inch long and 2.5cm wide meaning I could have room for approximately seven tabs if equally spaced. I prefer to have all my sections visible rather than layered. If you want/need more sections, just cut your tabs smaller or layer the tabs, play around and see what works best for you. 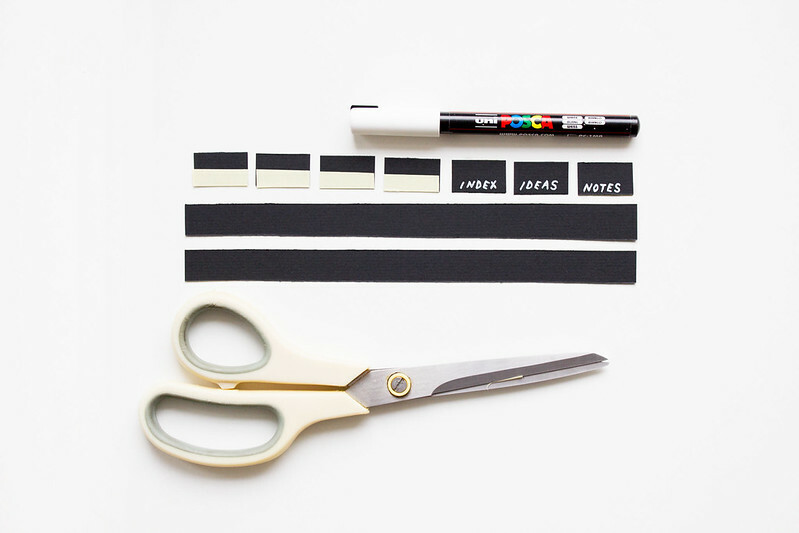 Using double-sided tape, stick your tabs into place using the lines to help position them correctly. 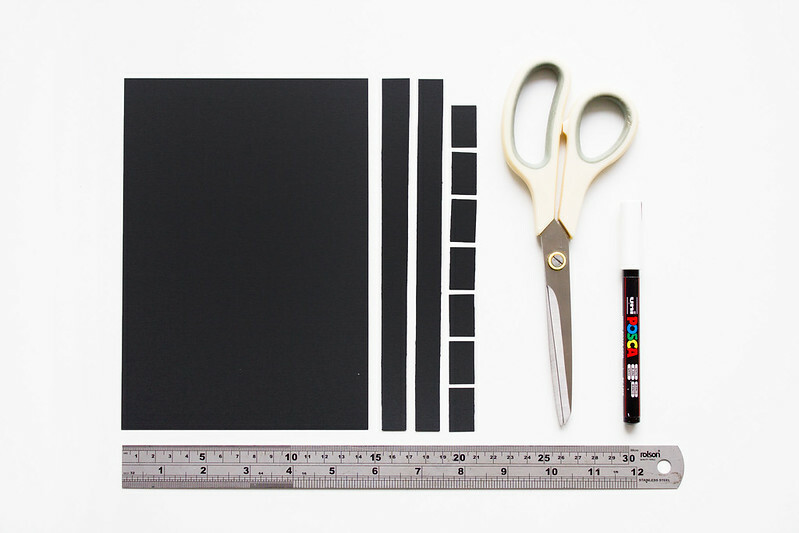 I used black card and a white Posca pen but you could print your tabs or even implement a colour coded system. I also used matte black washi tape to create headers for each page. I worked out page allocation based on my previous notebook. Most of my notebook was taken up with ideas and notes on each post so I split the pages up pretty evenly between those two and limited the other tabs to only one or two pages. My planners are used purely for rough ideas and notes, everything else is done digitally. However, other people use theirs as a complete editorial planner, which requires yearly and monthly calendars, pages for post ideas, rough drafts, and social media management sections. 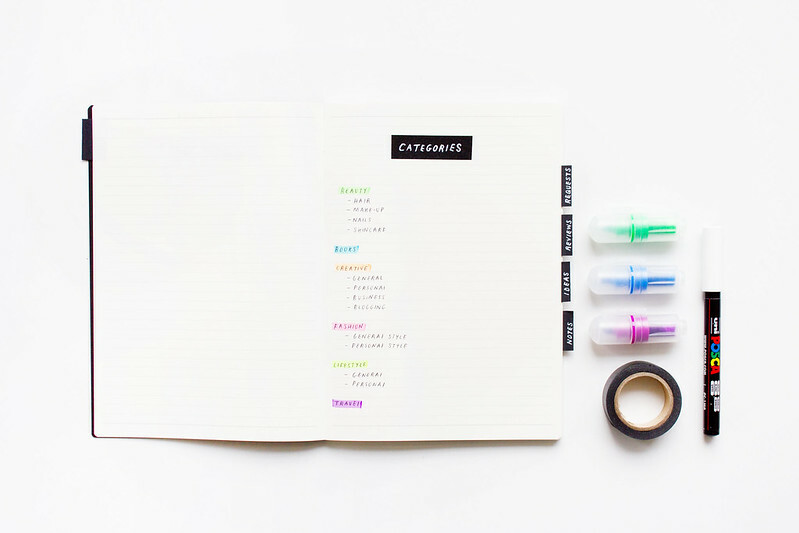 I have developed a personal organisation system that includes colour coding and symbols to keep track of my thoughts, ideas, to-do lists, and tasks. I developed my own system by pulling ideas and methods from other people’s systems and implementing them into my own routine. I ditched the ones that didn’t work for me and kept the ones that did; it’s an on-going process. If you are new to the process of planning, take a look at Bullet Journal for ideas on how to implement a system that works for you.